The yin and yang of the superhero world, Hank and Don Hall were complete opposites, working together as powerful vigilante champions for justice. Opinionated and reactionary, Hank always butted heads with his reasonable, yet indecisive, brother. The Lords of Chaos bestowed upon Hank powers that came about when he uttered the word, "hawk," and his brother was imbued with the same powers from the Lords of Order. Working together, "Hawk" and "Dove" balanced each other out and battled evil. Technically he didn't get his powers when he said the word hawk, he got them when he said the name Hawk. With a capital H. It's a minor difference, but it matters. It's a question of intent, you know? Otherwise phoenetics would be hell for him. You don't want your red and white spandex popping into view when you go to the pawn shop to hock some valuables. Hawk, as a character, is all about rage and stupid brute force, and of course he uses the "big" male body. No reason to start getting innovative now at the end, right? It suits him, anyway: he's big and tough, it's big and tough, what more could you want? He does get a new sculpt for his cape-thing, though. I don't really know what you call that thing: six pointy strands of cloth(?) rising up and then hanging off his shoulders. You can't even blame Liefeld for that one, because Hawk's had that since the beginning. It's a separate piece, molded in PVC and glued into Hawk's back-hole. The rest of the costume details are simply painted on - but rather than a pure white, those sections of his costume are a pale gray. 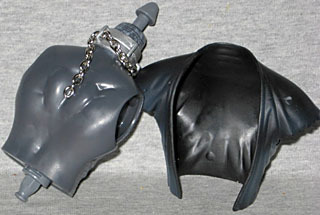 Hey, that's a lot better than trying to spray on blue shadows, like Marvel Legends always did, right? 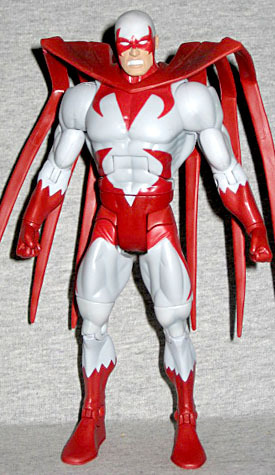 His teeth and eyes are white, and naturally the head is unique: his ears poke out of the mask, and the edge around his jaw is sculpted. 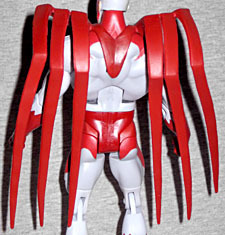 Hawk has no "extra" articulation, just the DCUC standards: hinged ankles, hinged knees, swivel thighs, H-hips, swivel waist, hinged torso, swivel wrists, hinged elbows, swivel biceps, swivel/hinge shoulders and a balljointed neck. It's not enough to really duplicate the kinds of stances he would take when Liefeld was drawing the book, but it's sufficient. Would we like more? Yes. Would any other company have given us more by now? Yes. But do we expect more? After 20 series of figures, no. Congratulations, Mattel, you win: you've effectively worn us down, beaten the optimism out of us. You happy? Hawk has no accessories, just his piece of the Series 20 build-a-figure, Nekron. If you want to get really technical, he gets two pieces: he has the upper torso, which also includes a removable vest/smock thing. The chains attached to the collar on the neck are real metal, and there's a texture of desiccation on the exposed skin (it doesn't continue on the back, because that would be hidden beneath the shirt). There's no denying that Hawk is a plain, unremarkable figure - his strange cape is the only thing keeping him from being totally dull - but the figure we got suits the character. Being unremarkable means there's not really to complain about, either. 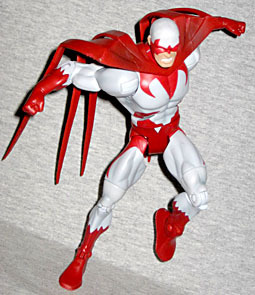 Besides, what else are you going to do, buy the DC Direct "Brightest Day" Hawk? Doubtful. This is a fine, workmanlike offering, just like Hawk is a fine, workmanlike comic character.